Enjoy big sound in a small package with the blue MUVO mini Portable Bluetooth Speaker from Creative Labs. This speaker connects to your mobile device wirelessly through Bluetooth or 3.5mm AUX audio cable. Its dual full-range micro drivers pair up with an oversized passive bass radiator for enhanced loudness and bass performance. An IP66 rating means that the MUVO mini is water- and dust-resistant. The MUVO mini is equipped with NFC, which allows you to wirelessly pair your NFC-enabled mobile device over Bluetooth by touching it to the NFC icon on the speaker's chassis. An AUX-in jack lets you connect analog devices with a 3.5mm AUX audio cable. A built-in microphone lets you talk on speakerphone via Bluetooth, and a tap of a button resumes your playlist. The integrated battery powers the MUVO mini for up to ten hours. It recharges through the included micro-USB cable. The MUVO mini features Bluetooth 4.0 with support for A2DP, AVRCP, and HFP. The MUVO mini also supports the SBC Bluetooth audio codec. 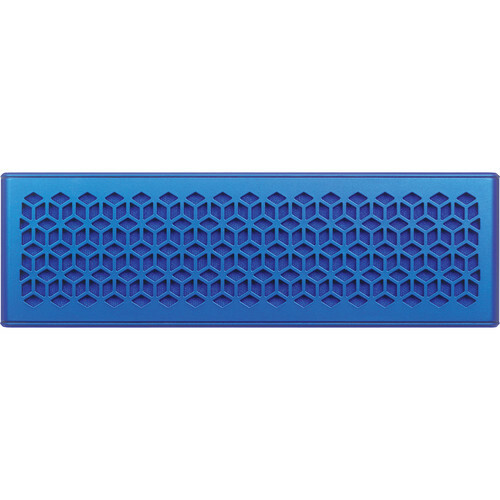 Box Dimensions (LxWxH) 8.0 x 3.7 x 2.4"
MUVO mini Portable Bluetooth Speaker (Blue) is rated 4.0 out of 5 by 1. Rated 4 out of 5 by Anonymous from Like it! I like it. Could be louder but I like it!